Attended the Seaside hamfest this weekend. I am pretty sure that I attended my first one 30 years ago or really close to it. I enjoy seeing people and hanging out, but there is little at the hamfest that actually interests me. I bought my normal bag of adapters and misc. connectors and then tried to wonder around the main flea market area. Since I’m still not doing great with the leg thing, I ended up going back to the room to rest after an hour. My main reason for coming this year was to give a talk on the WWARA and repeater coordination. The idea was to hold a short membership meeting during the talk (which I managed todo in less than two minutes) and then give a talk about what repeater coordination actually is and some of the things the WWARA does for regular hams. The room was nearly filled and people were asking questions, so I’m going to call it a success. Here is a link to the talk. Posted in Ham Radio, Travel | Comments Off on Seaside Hamfest and WWARA Talk…. Last full day in Paris is almost over. And if you havne’t noticed a trend so far, things didn’t quite go as planned. I overslept a bit, since I was awaken around 4am by someone yelling in the street. He was at it for nearly an hour and it took me a while to get back sleep again. No clue what is was, I am guessing it was workmen doing something, since he wasn’t so much screaming, but yelling at people todo things. So late start meant I missed breakfast in the hotel. 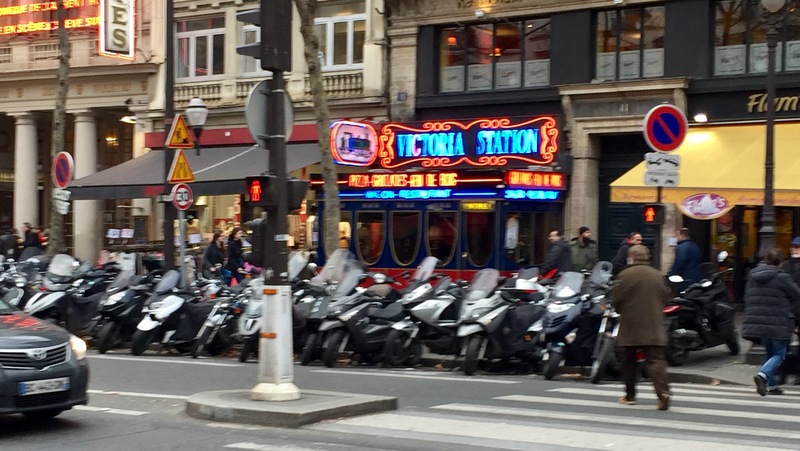 This has been the safest place for me to eat by far in Paris. I tried a couple bites of a almond croissant Rosie brought back and just had my tea. We finally hit the street close to noon and headed towards the Eiffel Tower. It is a nice long walk from our hotel, close to an hour according to Google Maps. I haven’t mentioned this yet, but walking with Isaac and Rosie is a little difficult for me. They are both MUCH, MUCH slower than I. Which means I am either having to stop all the time to wait for them, or running into the back of them. So I suspect the walk would have taken longer than the estimated 60 minutes. 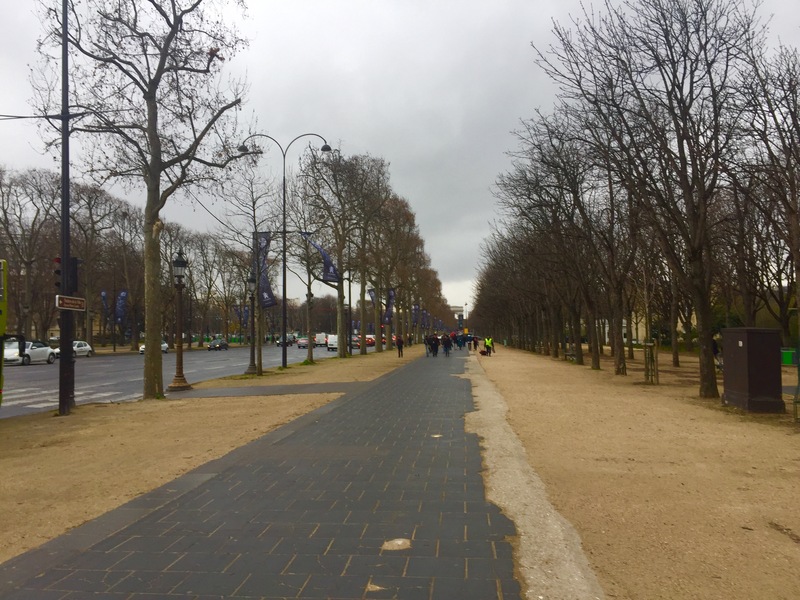 We took off towards the Tuileries Gardens and then hung a right onto the Champs Elysé. This was one of the planned places to visit, which I had figured wasn’t going to happen. But it was basically on our way and mostly in the right direction. Again, it was one of those situations where you could tell it was really pretty in the spring/summer, but today it was blah. As you can see, the sky was pretty grey and it had just started switching from the misting to raining phase at this point. As we kept going, it switched from raining to dumping serious water on us, which was made worst by the wind starting to blow it sidewise. At this point, Rosie declared we had got close enough and were were heading back to the hotel. 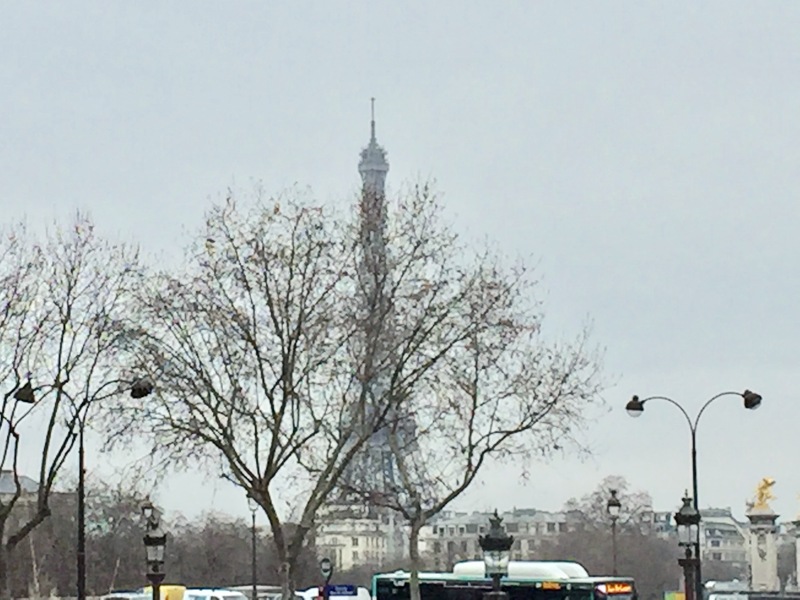 This was the best view of the Eiffel Tower I got…. In London I had downloaded an app for my phone which would take the beginning and ending points and tell you which trains to use. 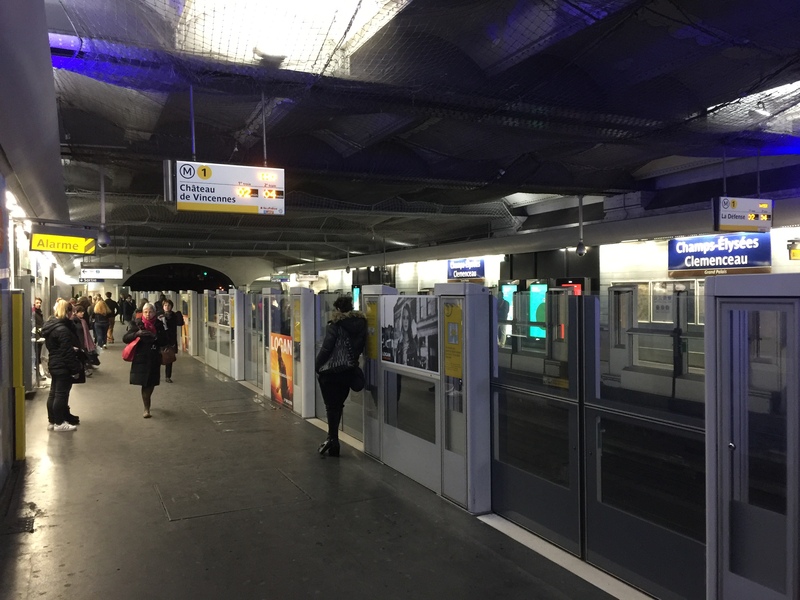 I hadn’t planned on using the Metro in Paris, so I never looked for a similar app. But between GoogleMaps and Rosie decoding the signs, we figure out how to get back to our hotel. 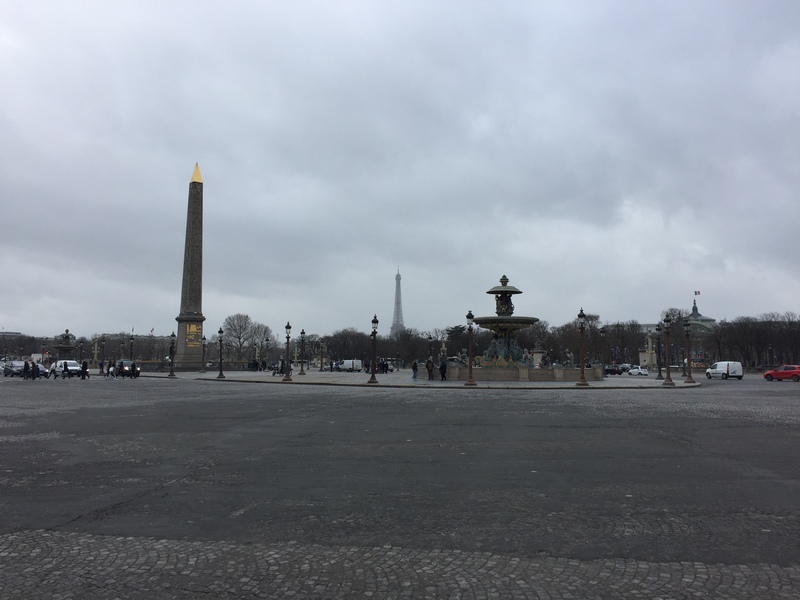 I was really hoping that once it stopped raining and we dried out, we’d make another trip on the Metro to see the Eiffel Tower, but it didn’t happen. Rosie and I ended up taking naps, while Isaac watched tv shows on his iPad. We finally got moving around 7pm and walked across the street to have noodles.Tomorrow we fly out in the morning back to the States. Since the trip home is naturally longer, I decided to add a layover in Dallas. We are on the plane from Paris to DFW about the same amount of time as the flight from Seattle to London, but need another three hours to make it the rest of the way home. I figured a 2.5 hour layover to get off the plane, stretch and move around was a good plan. It means we won’t get home until nearly 8PM on Friday, but I think it was a smart move. 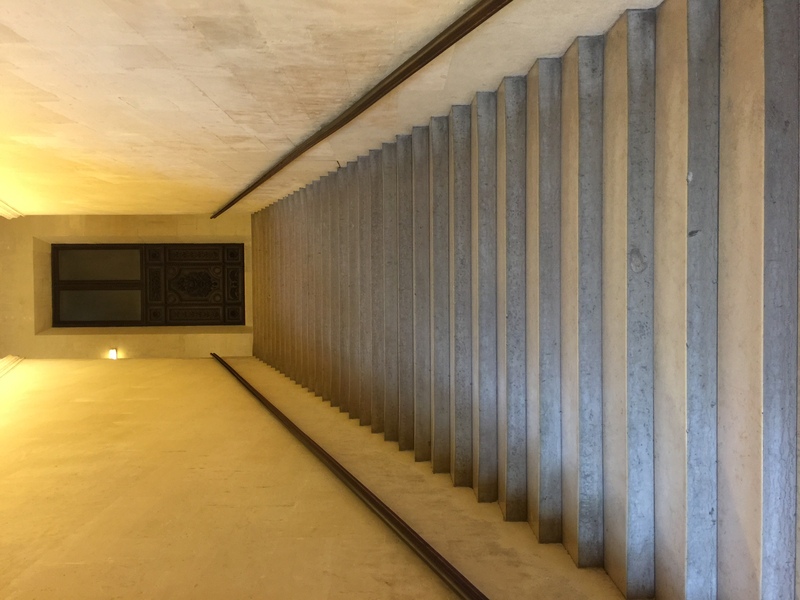 Posted in Life, Travel | Comments Off on Paris, day eleven…..
We jumped the shark yesterday. All of us are ready to go home and having a hard time forcing ourselves todo anything except lay in the hotel room. 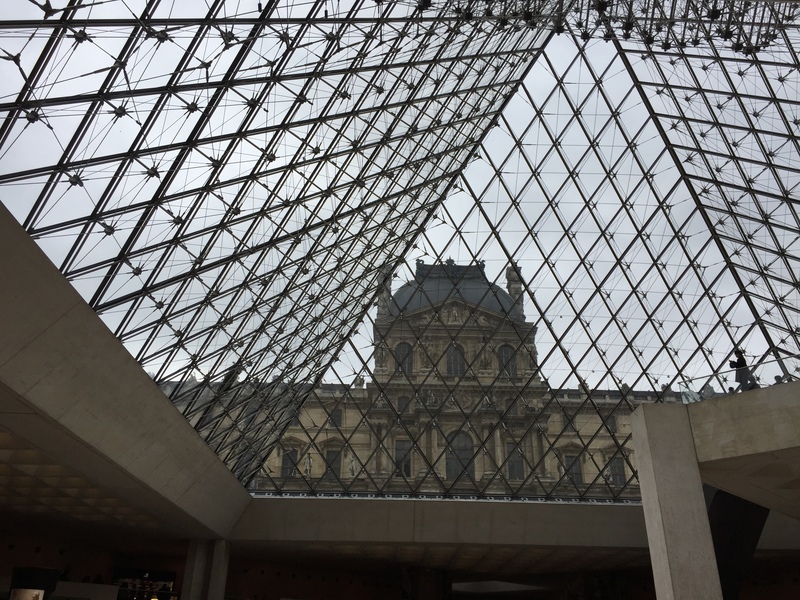 Yesterday we set aside for the Louvre, and we did a pretty good job of getting up and walking over by 10:30am. (It doesn’t actually open until 10am) But once we got to the entrance, we realized the line for the people without tickets was huge. As Rosie and I tried to figure out how to buy them online, we stood in line. So you can buy tickets online, but you have to physically print them. So we stood in line for about an hour to get into the door. 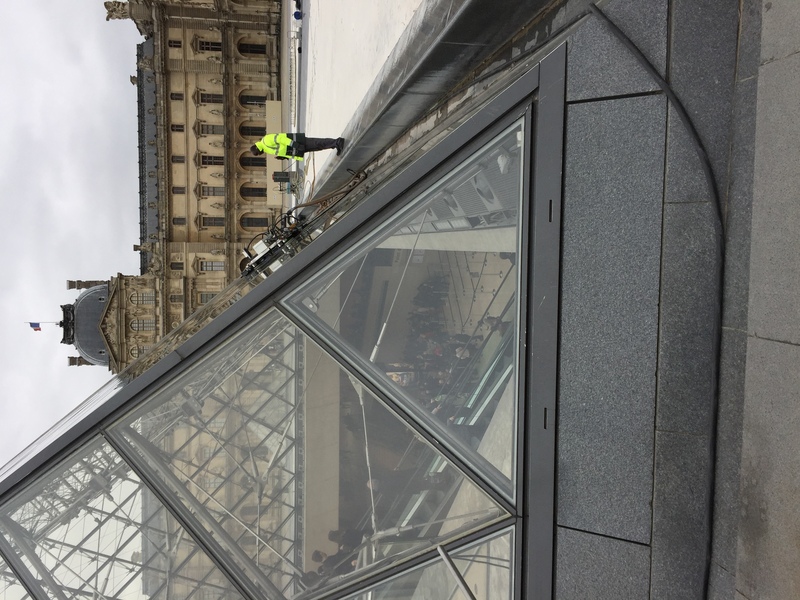 By the way, I didn’t know this until yesterday, but the big glass Pyramid at the Louvre is actually surrounded by three smaller glass pyramids. As you can see, the line was pretty crazy to get in the door. We found out once we got to the front, it was really just waiting for security. Everybody was having their bags searched (through x-ray machine) and then you personally walk through a metal detector. Later in the day we saw a bunch of soldiers in their full kits and rifles out in one of the main court yards. After getting through one part of the Roman/Greek statue section, we doubled back to the main courtyard and got lunch. Food has been pretty tough on me since we got to Paris, about two out of three meals has got me sick. We had Pho for dinner last night, which I was Ok with, but it got both Rosie and Isaac sick. Anyhow, after lunch we decided to split up. We really wanted to see different things. I told Rosie and Isaac about the spnix, which they took off to see and I tried to find the Italian artist section. 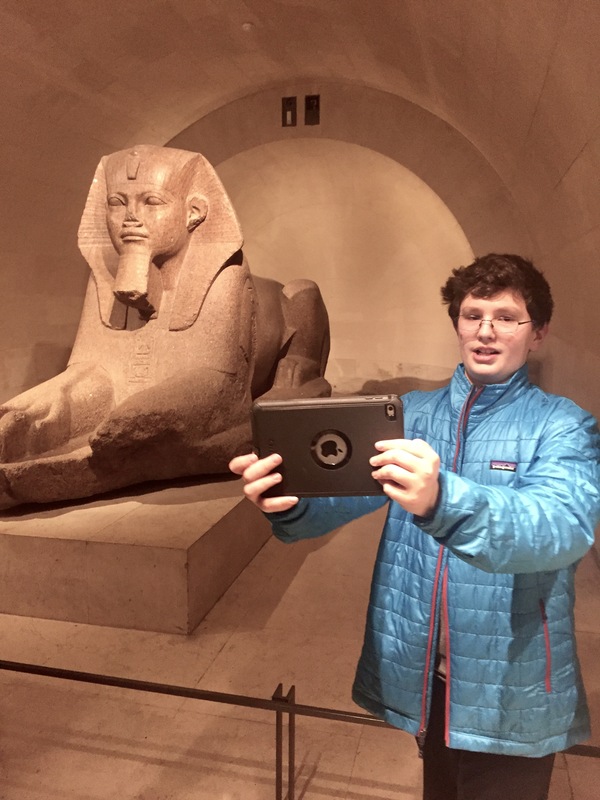 Here is my suggestion for anybody planning on visiting the Louvre, spend some time planning out your visit ahead of time. The first problem is the place is just huge, I sort of doubt you could physically walk the entire thing in a day. The second problem is the layout is super confusing. There are actually five levels, three of them underground, but you can’t get between levels at all junctions. Additionally it is designed so you can get from one major section to another, without going back to the common center court yard. It took me about an hour to figure out the second point. I knew were I wanted to go, but I couldn’t figure out how to get there. 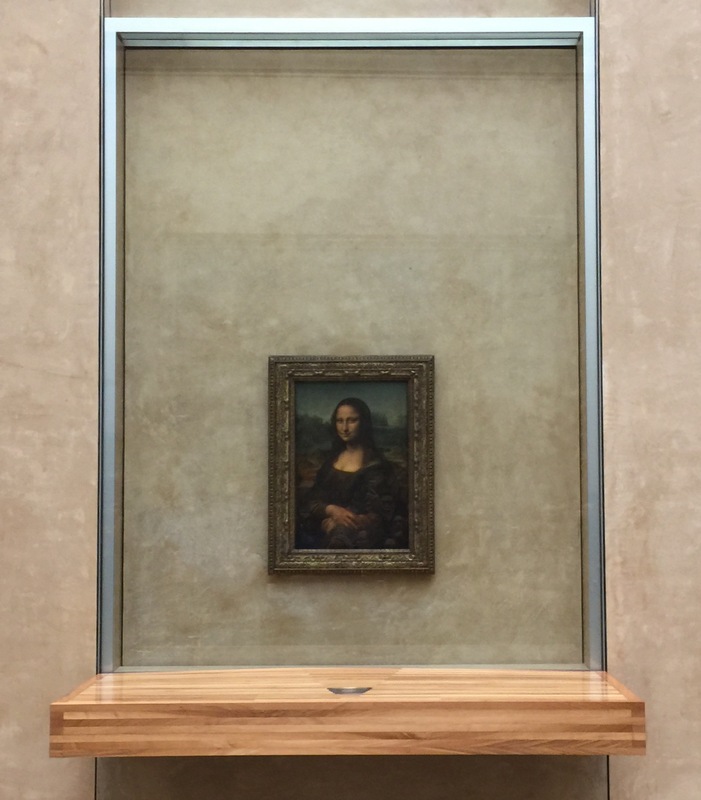 I saw a bunch of amazing things and eventually even found the Mona Lisa, but I was just ready to head back to the hotel after three hours. I think Rosie and Isaac did a better job seeing things. 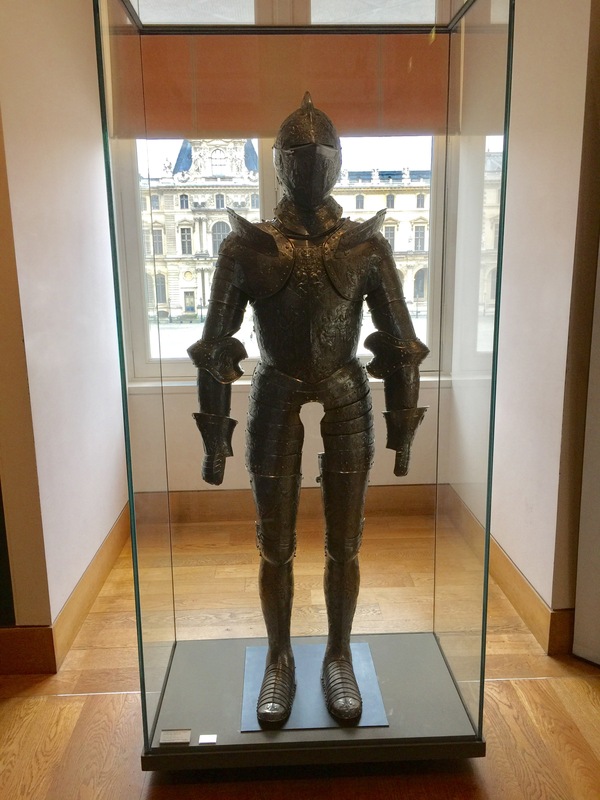 I found a room full of medial weapons and this full suit of armor. I sort of wish I had some reference for size, but I think Isaac might have been to tall to wear it. 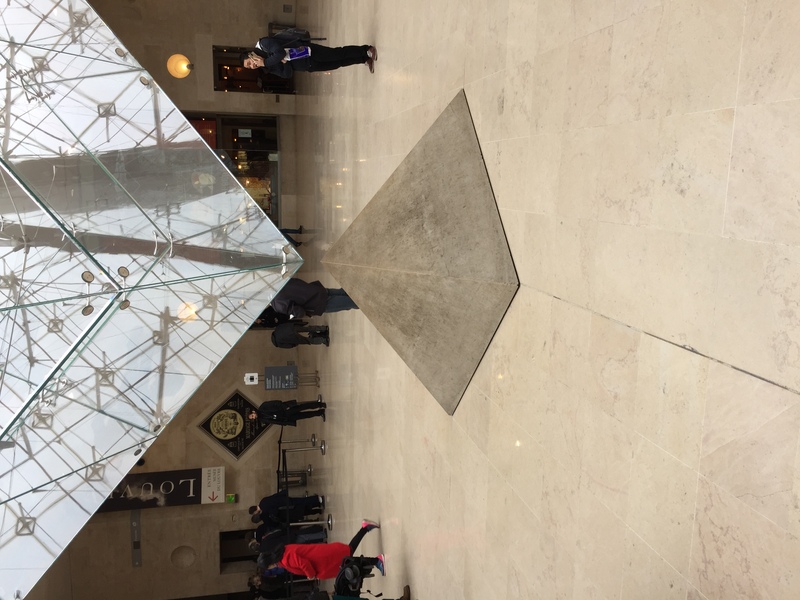 So the glass Pyramid isn’t technically a pyramid, since there is a mirror image below it. Making it really a glass diamond. Lots of people were taking selfie’s, but lining things up so it looked like they were holding the diamond on their hand. I actually thought the view out was pretty amazing. This is one of the few outside pictures that I didn’t lighten up. You can see just how ‘grey’ it was outside. The entire week has been like that, next time we will have to come in the spring time. Here is its, the most famous painting in the world. This picture is cropped and taken about 20 feet back. The mass of people in front of the line was crazy and the line is a good 10 feet from the actual painting. Several random comments. I was surprised by how big it was, I expected it to be much smaller. The other really surprising thing is this was the most security of any painting / exhibit. You could touch all of the statues and most stuff didn’t have any glass over the paintings. The other interesting thing, nobody was touching/climbing over ropes to get closer. People were being respectful. I felt horrible, because I doubt it would be that way at home. This is just a random stair way I came across. I really liked the look and it was one of those rare instances where there wasn’t a ton of people around. It also gives you a good view of the architecture. 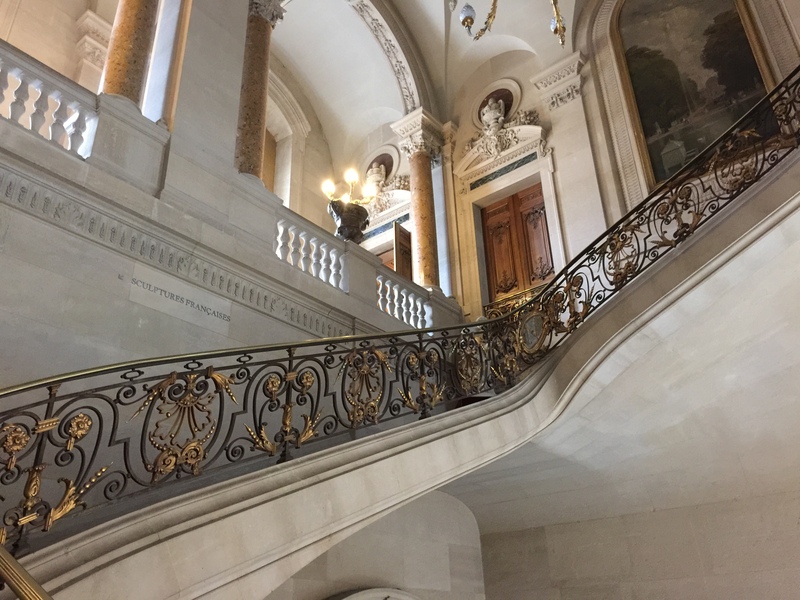 Most of the stairs and hallways were stone/marble. 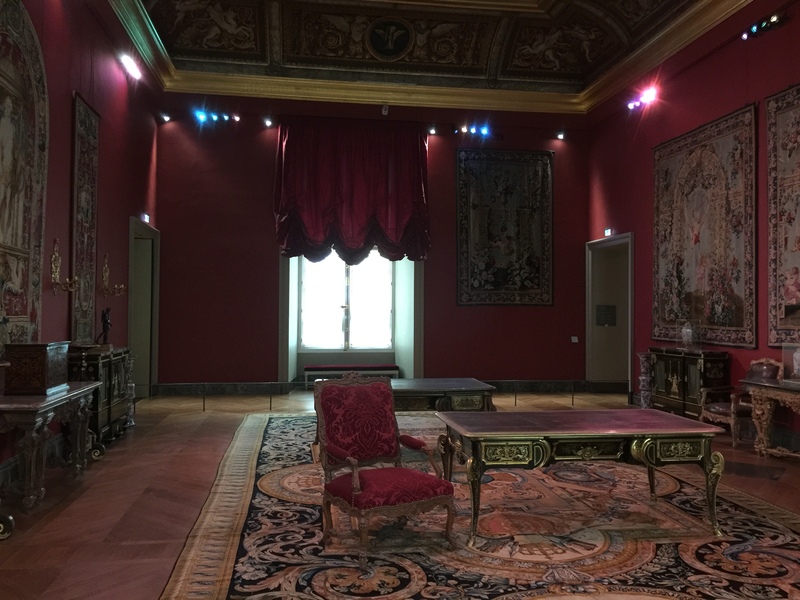 At one point when I got lost, I came across this section which had full rooms from old French palaces. There was nothing but a low rope separating you from the exhibit. I might have mentioned that I was getting tired. This is another staircase that looked cool to me. While there were a lot of people in some sections of the museum, there were others that were nearly empty. This was one of the empty ones. I have to wonder if it is was because people weren’t as interested or they couldn’t find them.Eventually I met back up with Rosie and Isaac. They were late, because they were making a run to see the Mona Lisa before leaving. It was actually pretty easy to get to it, once you realized which of the half dozen ‘entrances’ to take. 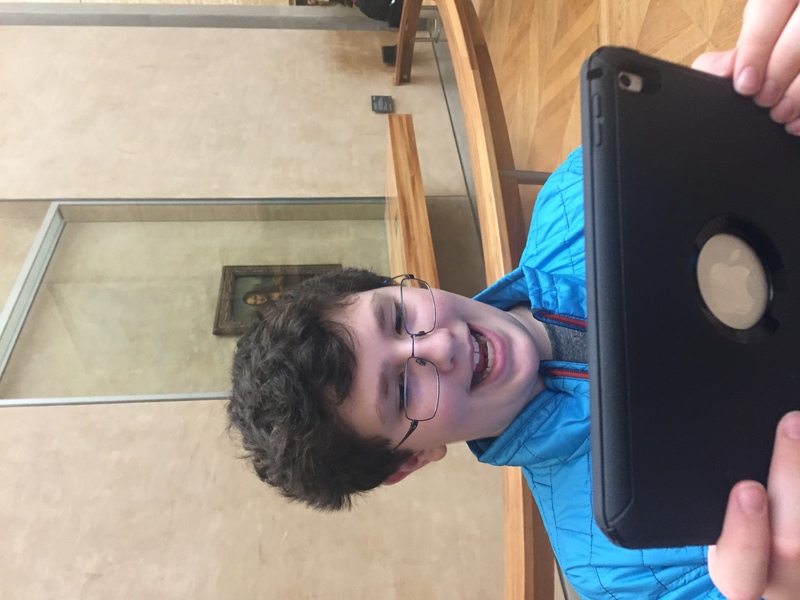 As we headed out of the Louvre, we came across a Apple Store. I might have known there was one here, but had forgotten. It was a pretty good size store to, I guess the Louvre is part shopping mall now. There were dozens of stores you had to walk past to get out. 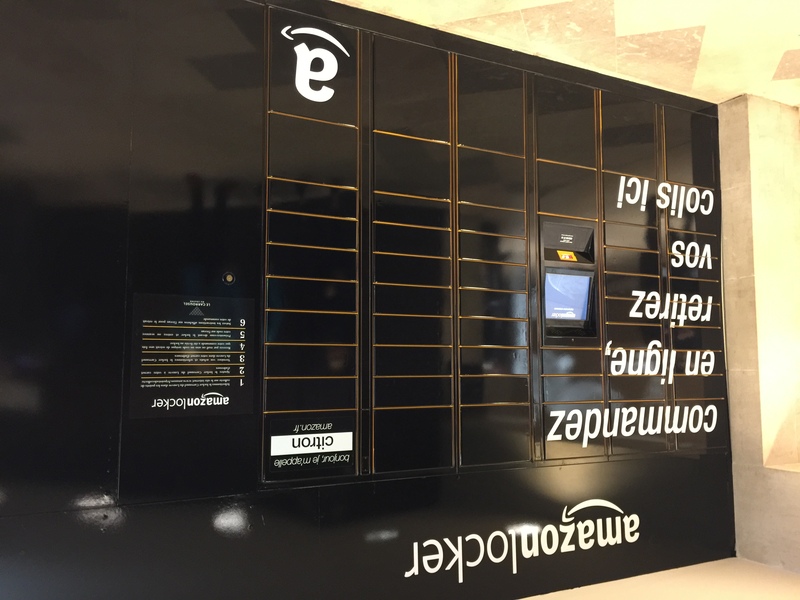 I also found a set of Amazon lockers, I guess people may want to have their deliveries shipped to the Louvre to pick up on the way home. We honestly didn’t do much else the rest of the day. We came back to the hotel and Rosie took a nap, while Isaac read. I had to run back to the SFR store and top up my iPhone SIM. It seems that I had burn through 5Gb’s of data on my phone since Monday. I was a little shocked by this, since I had used less than 3GB in London and we were there seven days. While I was waiting to puchase the top up, I poked around and discovered what happen. I had told my phone to update a bunch of Apps on Tuesday. I used 3GB alone on that little transaction. I have been doing EVERYTHING via my phone since getting to London, including turning it into a hotspot for my iPad and Kindle. The hotel WiFi doesn’t work very well, so it was easier to just use the cell. (And faster) Oh well. It was only 30 EUR to buy another 8GB (cheaper than buy 2GB). So now I am trying to burn through 8GB before going home tomorrow. I may download a movie to my phone via Amazon Prime or something. 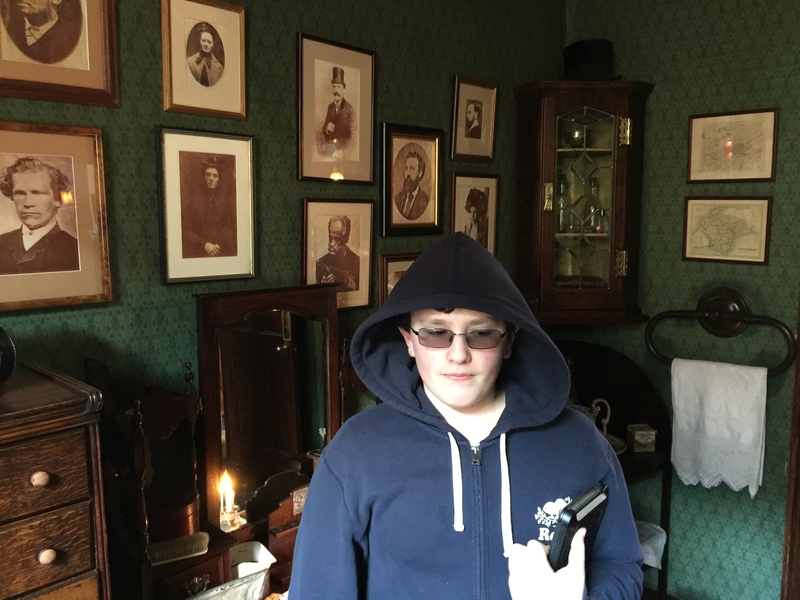 Posted in Geek, Life, Travel | Comments Off on Paris, day ten…. 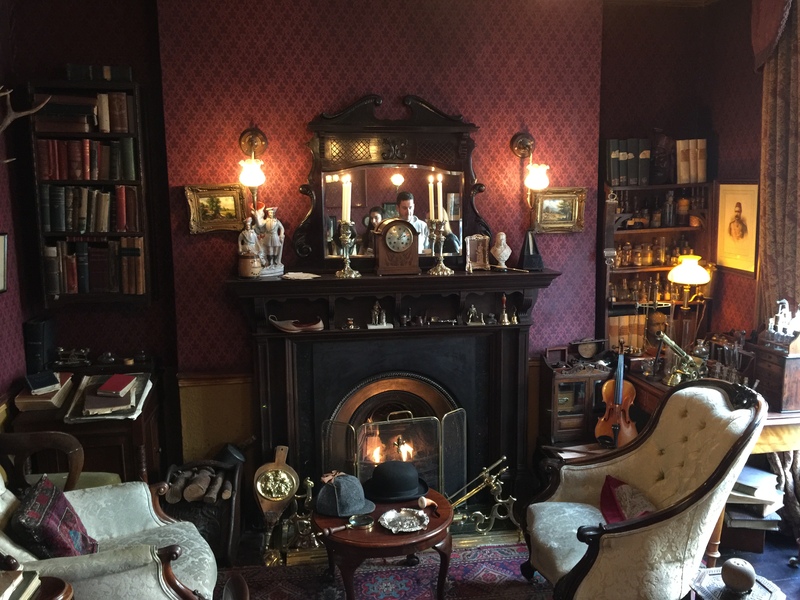 So I spent most of the afternoon in the room. 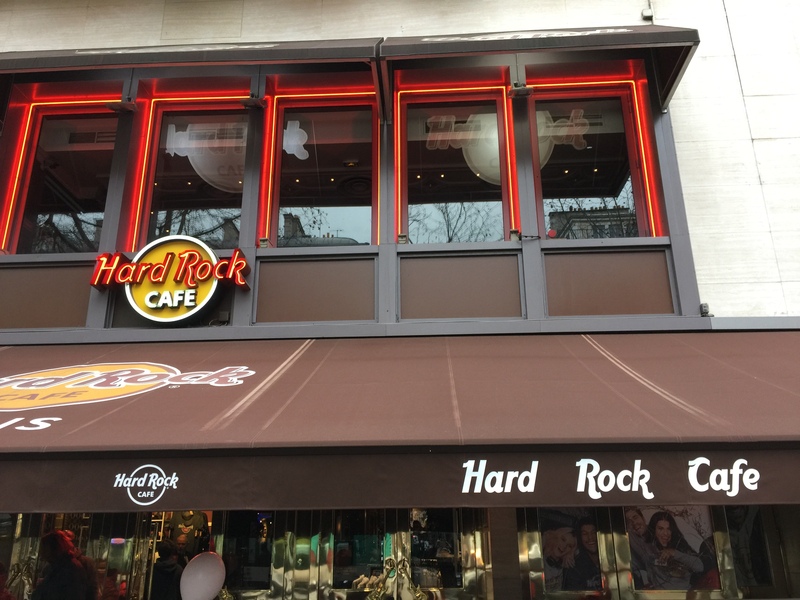 Later in the afternoon, Rosie and Isaac went for a walk and found the Hard Rock Cafe in Paris, where we decided to have dinner. The food was OK and less likely to continue poison milk. After dinner, we walked back down by the big mall we went to earlier and found the Apple Store. This must be one of the flag ship stores, it was really amazing. 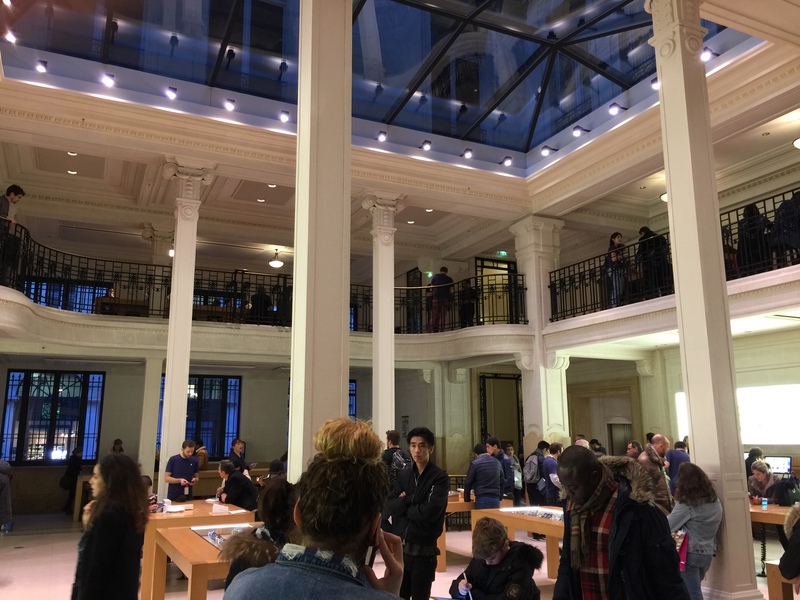 I had never been in a multi-floor Apple Store before and certainly not one with a basement. 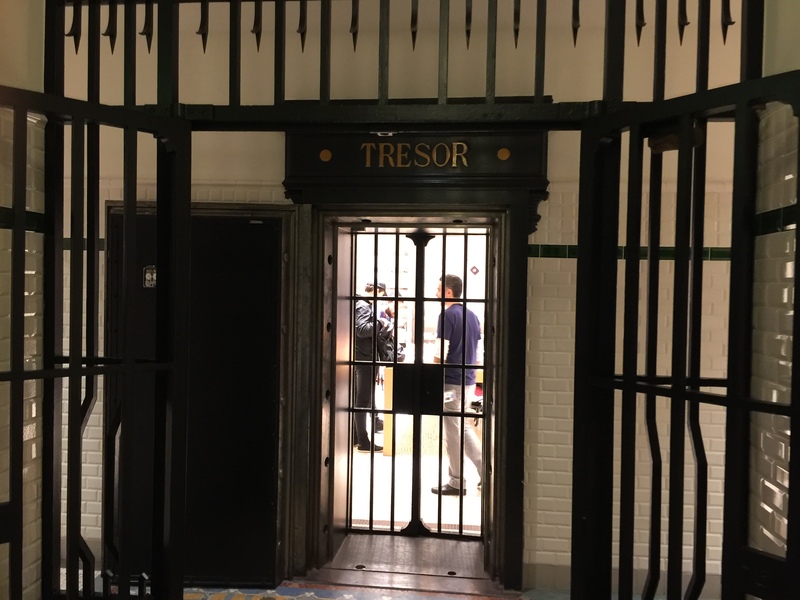 I am pretty sure this was originally a bank, because the accessory section was inside what looked like a real vault. The main floor had the normal display tables with macs, iPads and iPhones. You can see the second floor, which wrapped around the big open space of the ground floor in the picture. The upstairs was full of Genius Bar tables and people getting help. 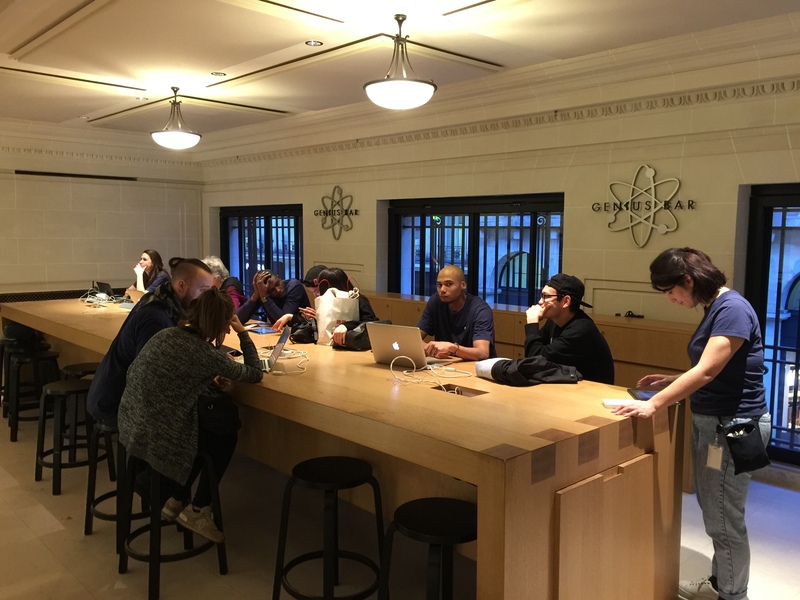 So this was on a Tuesday night, around 6:30 and the store was pretty full and all the spots at the half dozen Genius Bar tables were full. After the Apple Store, we just walked back to the hotel and spent the rest of the evening in. The plan tomorrow is to get up early (meaning before 10am) and be ready to hike over to the Louvre. Most of the stores and museums here don’t open until 10am, which fits my time table just fine. The plan is to spend the whole day there and then have dinner. Hopefully it will be dark then, so we can see the Eiffel Tower at night. We have pretty much given up on the idea of going up it, everything we have read has said the wait can be four hours or more. Plus I don’t have any desire to hike up that many stairs. So Paris is the city of scooters. I saw a fair number of them in London, but nothing like here. They are everywhere and so many different kinds/sizes. Plus there are nearly zero motorcycles, it is all scooters. (The difference is a scooter has a seat like a chair and you don’t use your feet for anything.) With so many scooters and zero extra space, you find these rows of them all over the sidewalks. 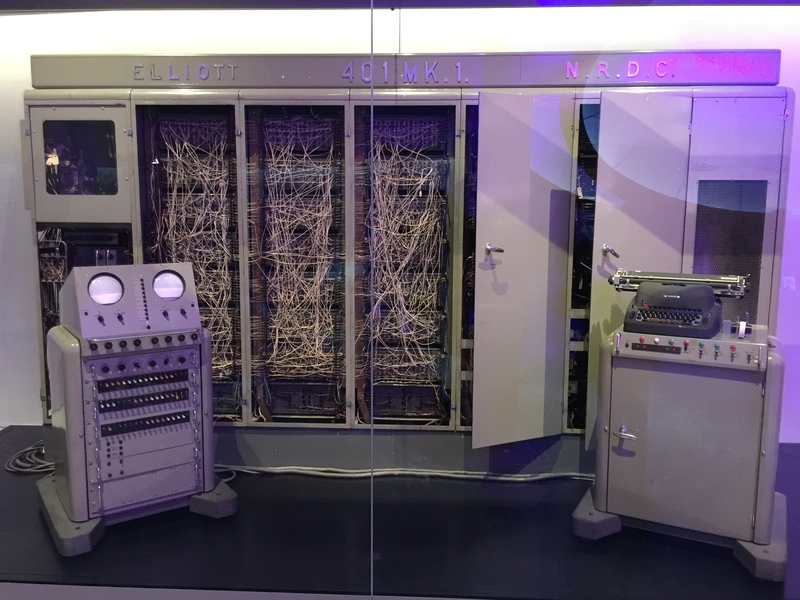 Posted in Geek, Life, Travel | Comments Off on Paris, day nine…. 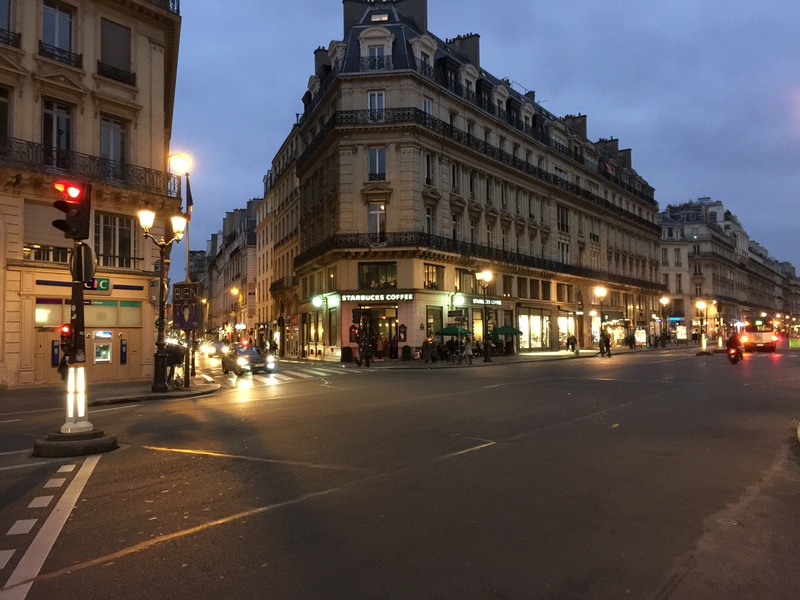 So today (Feb 20) was our first full day in Paris, but we didn’t exactly hit the ground running. It was more of a slow stumble, then finally making it up to walking speed. I am still not feeling great, but much better than Sunday, so we tried to-do simpler things today. After breakfast in our hotel, our first stop was a SfR store which was right around the corner. We needed to trade in our London SIM’s and purchase Paris SIM’s for our phones. I known it is crazy to buy local SIM’s for just five days, but we use our phones for so much. We navigate using Google Maps, we SMS back and forth when separated and even right now I’m using it to write this update. (Internet in the hotel feels like 56k dial up) The $25 it costs each of us is well worth it. After that we headed to a large shopping mall that Rosie found earlier, because I needed to buy a new pair of shoes. I couldn’t believe it, but I wore out the pair brought. We have been doing 15K step days according to my FitBit and I had wore a hole on the ride insole. So after getting lost in the mall and figuring out the Men’s section was across the street, I found a nice new pair of shoes. 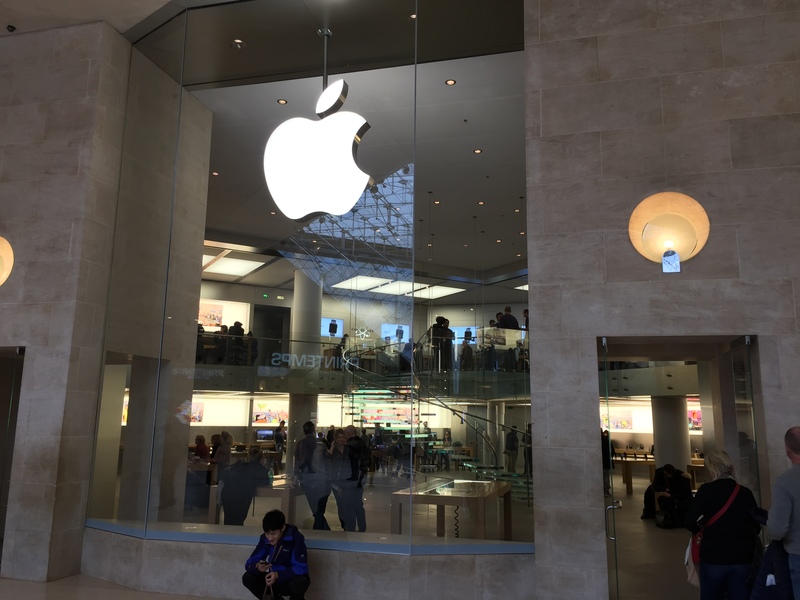 Not much to add, but we did walk by the Paris Apple Store, hopefully we will get to go back tomorrow and actually go inside. By this time it was lunch time, so we stopped at another close little mall/food court. I had a pickle and ham sandwich, which was pretty good. Rosie went hunting for fresh squeezed OJ, while Isaac and I wondered around. We ended up coming away with a bunch of fruit and two bottles of Rosie squeezed OJ. 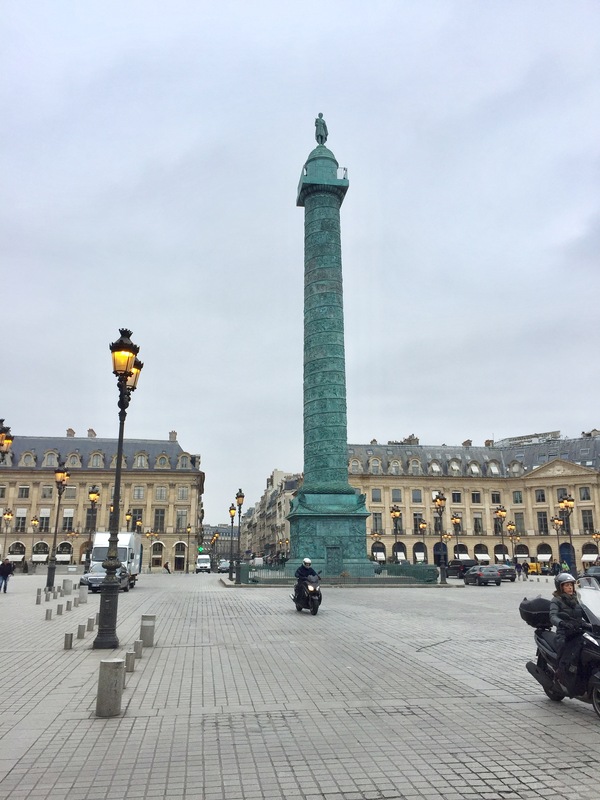 At this point we needed todo some actual site seeing, so we headed off to see the Place Vendome, which has the large green column in the middle with the statue on top. The court yard is ringed by fancy stores and famous hotels now. I took some pictures, but it was so grey yesterday, it really doesn’t capture the place. At this point, we headed back to the hotel for a break. (Remember, I was feeling pretty crappy) I changed my shoes and everybody chilled out for a while. 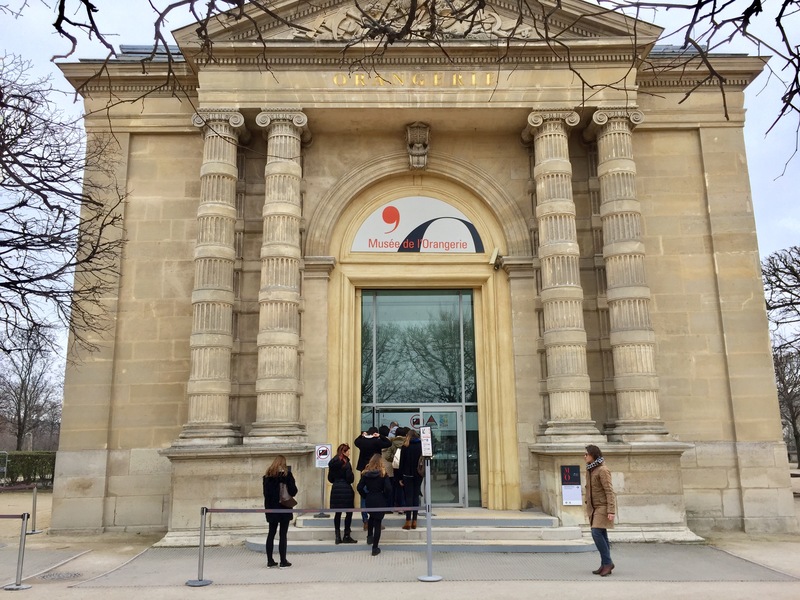 In the afternoon we decided to visit Musée de l’Orangerie, which turned out to be really close to Place Vendome. This was the top place I wanted to go in Paris, because it is where Monet’s Water Lily murals are located. They are just as amazing as I expected. I didn’t know this, but the two rooms where they are housed were specially built to specs by Monet. The rooms have these giant windows in the ceilings for light, but the light is difused by these screens. I thought about trying to take a pictures of it, but decided it was just not going to be possible to capture them. For those that don’t know, the murals are about five feet tall and over 30 feet long. They literally wrap around the room, since each wall is curved. There are eight total. So on the way to Musée de l’Orangerie, we pasted through the Tuileries Garden’s, which were apart of a large palace. Since it is the end of winter still, it looked pretty sparse. But you can tell how amazing it would be during the spring or summer when all the tree’s are in bloom. There is a giant ferries wheel at one end and community gardens and lots of kids play grounds. 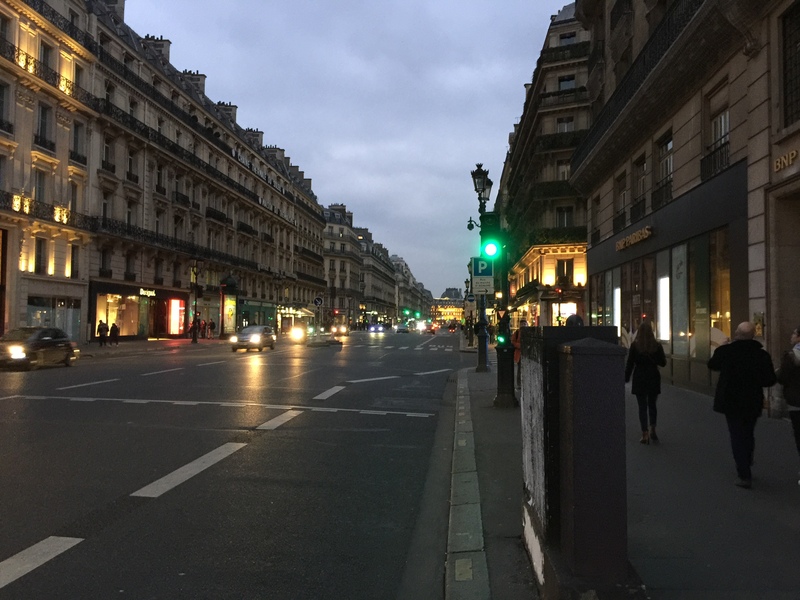 So at this point, we headed to a early dinner (super early for Paris) and then back to the hotel. I wanted to go to bed early. As it turned out, we found a pharmacist on the way back and was able to get some more meds for my cold. As I finish writing this the next morning, I feel way better today. I also slept for 11 hours and completely missed breakfast. I realized that I also got my first view of the Eiffel Tower yesterday, but I had to blow up the picture and mess with the lighting a little to see it. Today we are going to-do a bus tower of the city. 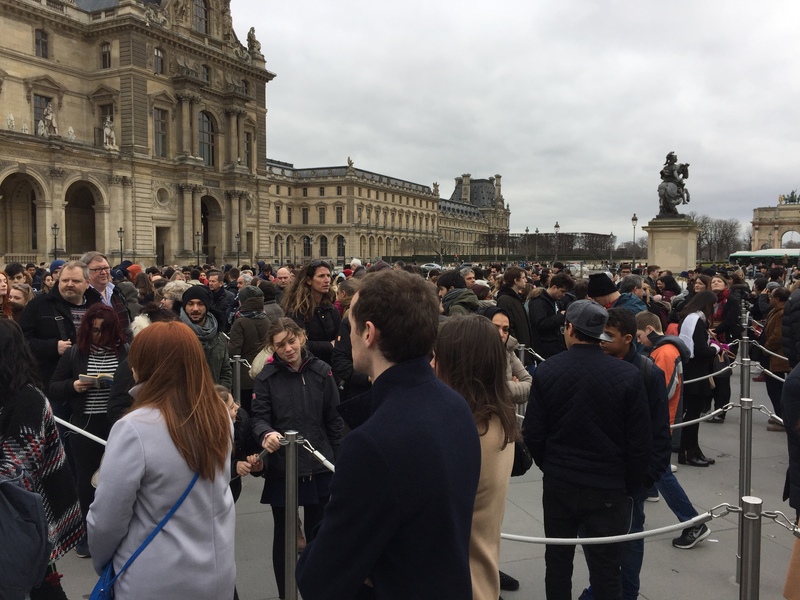 Posted in iOS, Life, Travel | Comments Off on Paris, day eight…. 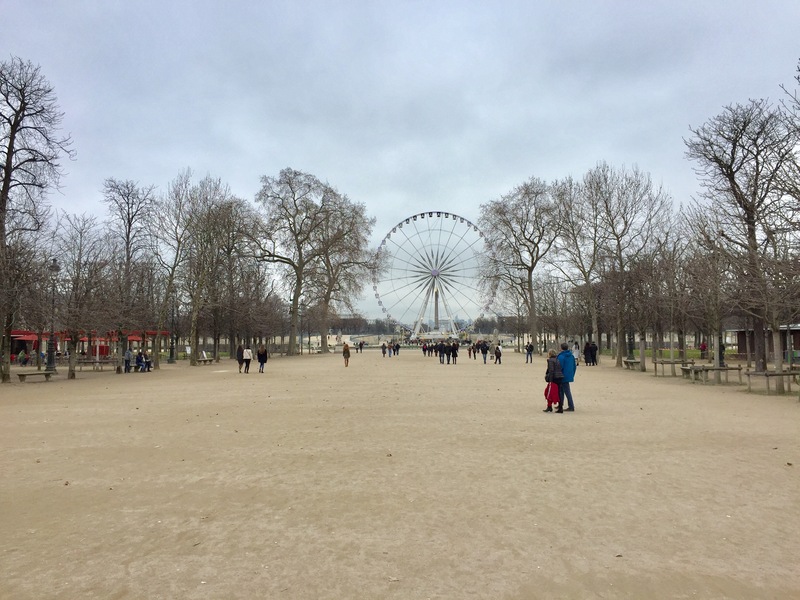 Still in catch up mode, so this post covers Sunday when we said goodbye to London and hello to Paris. Not much actually happened, since part of the day was taken up by the train ride and the rest I spent asleep. I mentioned this yesterday that I came down with a head cold that knocked me out on Sunday. I managed to make it to the train and fell asleep almost immediately. I woke up about 20 minutes outside of Paris, completely missing the tunnel under the channel that I was so looking forward to seeing. We actually cleared customs while in London, so exiting the train station was super simple. We did get caught behind this crazy mob, which we finally figured out were all waiting for some French celebrity to leave the first class train car, once that was finished, we got out to the taxis. Rosie decided to skip trying to figure the Metro in Paris, so we got a cab to the hotel and checked in. At that point I crashed again and am not entirely sure what Isaac and Rosie did. I know Rosie went exploring, since she brought back water with her. I missed lunch, so I was getting pretty hungry come dinner time, so we went to a ramen noodle place just down the block from the hotel. The noodles were good, but not as good as the ramen place we go to in Bellevue. Here are a couple pictures I took when we wondered around the neighborhood the first time. The one thing you notice is the lights and colors at night are just amazing. 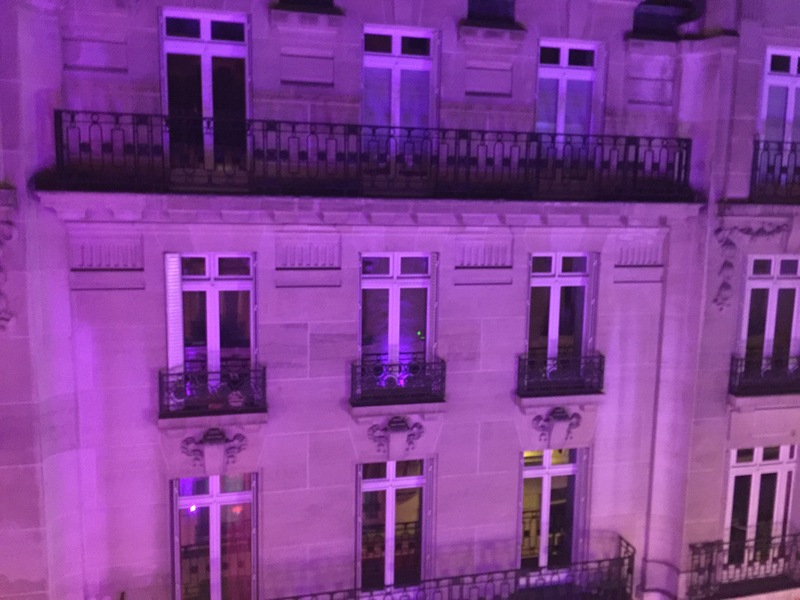 This is the view out of our window and yes, that purple color is exactly how it looks. And yes, there is a Starbucks just two blocks from our hotel. This might be my favorite one so far, I think I like the buildings here better than in London. Now I just wish they could figure out how to make a BTL correctly…. 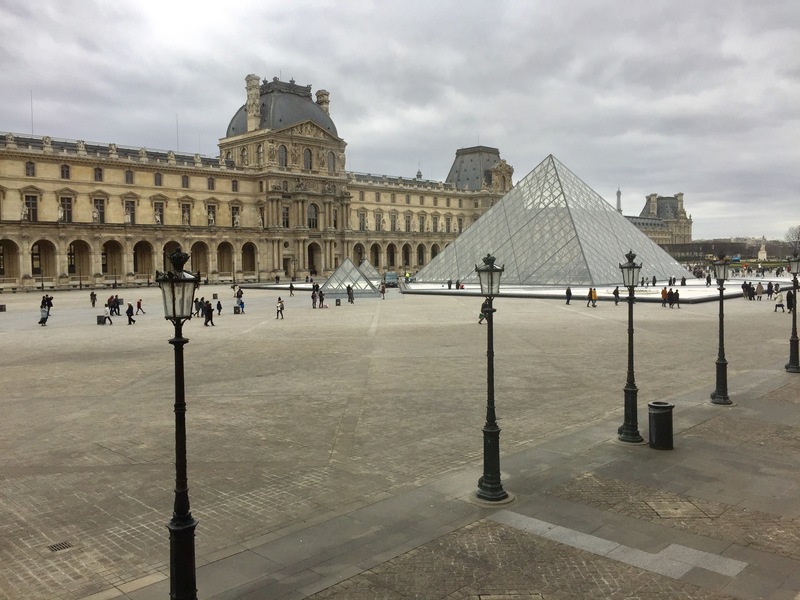 Posted in Life, Travel | Comments Off on London/Paris, day seven…. On our last full day in London, we headed to Greenwich. This was going to be Isaac’s and I only day ‘out of the city’. I say that, even though you can practically still see London. 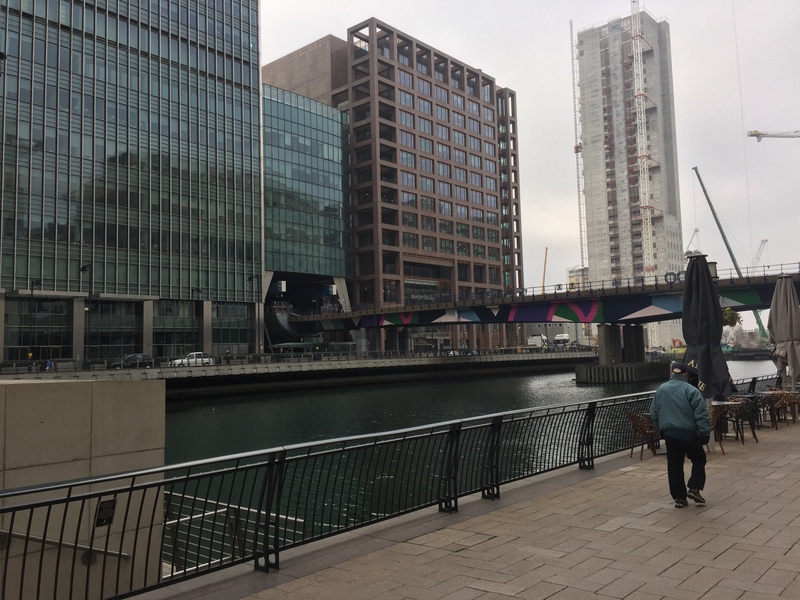 Rosie had spent Thursday visiting her companies UK office, so it was her second day trip. 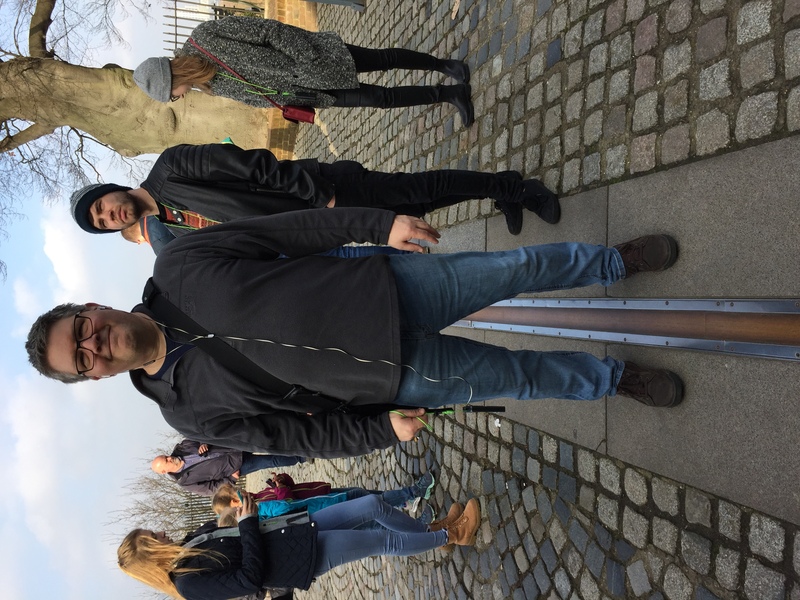 One of the top things on my list was visiting the Royal Observatory and standing on the Prime Meridian. This has to be a required stop for all geeks. The trip there was part Underground and then you switched to above ground trains. I have to stay the tube stop at Canary Wharf was one of the prettiest we’d seen. You left the Underground and had to walk through this big shopping mall/office building. We ended up having lunch at the mall before getting on the train to Greenwich. Once we were done with lunch, we got on the train and made the 15 minute run to Greenwich. Even though the train was above ground, the station at Greenwich had us arrive a couple levels below ground. After making our way back up and out of the station, we popped out into Greenwich down at the dock. The Royal Obsevatory is located about 15 minutes across town (and up a rather steep hill). The view from up there was really amazing, luckily the nices weather we had the whole week was Saturday afternoon. Kenny on west and east line…. There was a big plaque which explained why our GPS devices wouldn’t read zero at this spot, due to the fact that back in 1884 when the line was decided upon, the telescopes they were using weren’t ‘prefect‘. 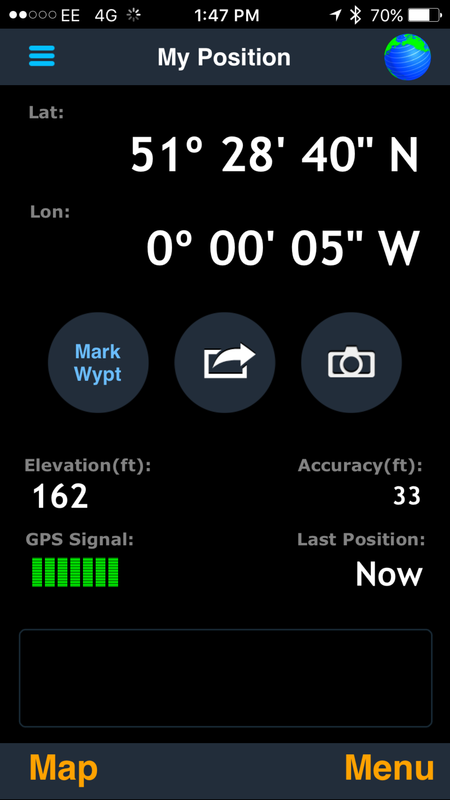 Now we use signals from the GPS satellites and the actual Prime Meridian is about 100 meters from where the line located. Damn technologies is always messing things up. The next stop was the fancy observation room built on top of the Observatory, which is actually called the “Star Room”. The whole tour was about how time, the stars and navigation were wrapped together for so long. 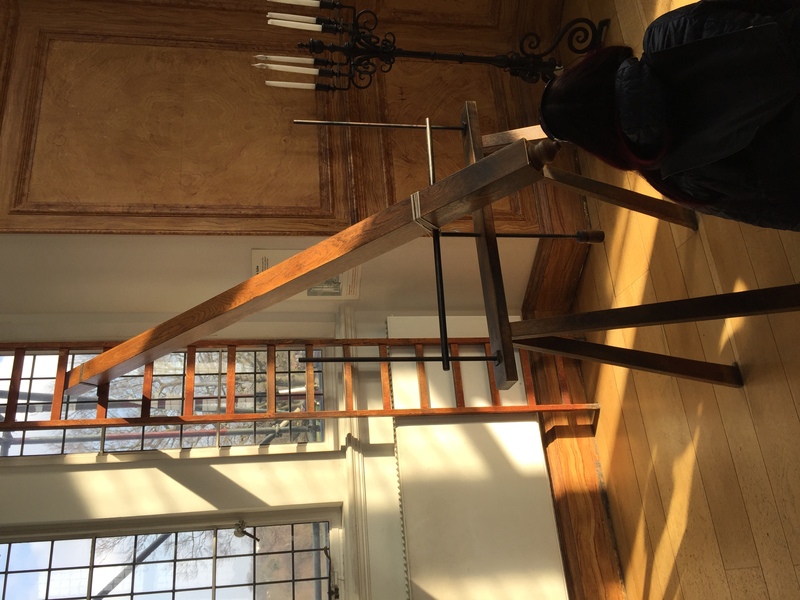 In this room one of the early Astronomers Royal, John Flamsteed made a bunch of really important star charts. The room is amazing, it is a big Ocagon and all the windows have these grids built into them to make it easier to set up the telescopes. There is also a huge clock that was a modern master piece of its time. Most of the clock was built into the walls. There were actually two, each with 14 foot pendulums that was custom made. The rest of the tour was focused on the big contest to make a clock that would keep time on a boat, they had the original four models of John Harrison’s clocks (H1-H4) on display, which finally won th 20,000 pound prize for being able to keep time while at sea.After finishing the tour, we wondered around Greenwich a little and had some snacks. Rosie found this vegan treat shop on the way in, which we stopped at as we headed out. They had the most amazing vegan brownie made out of sweet potatoes. I don’t like sweet potatoes, but I bribed Isaac to have half of his brownie after mine disappeared. 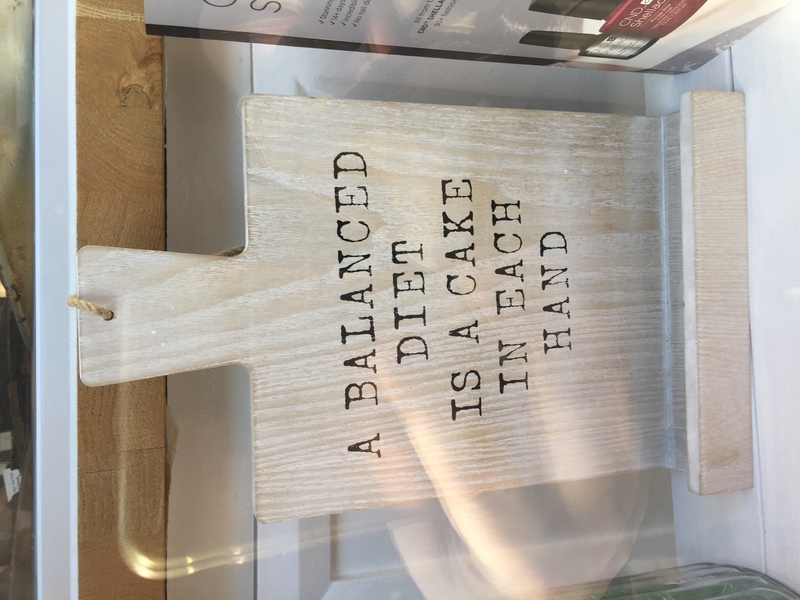 I think this sign sums it up pretty well…. So I might have mentioned before that nearly every Tube stop has a Starbucks, which is great. But as I discovered, most of them don’t have cold black tea for my Black Tea lemonades. So most of the week I have been having London Fogs, which is a Earl Grey with steamed soy milk and a couple shots of vanilla syrup. (You should try it, they are great!) But even that become difficult to get, because putting steamed soy milk into tea just isn’t a common thing. 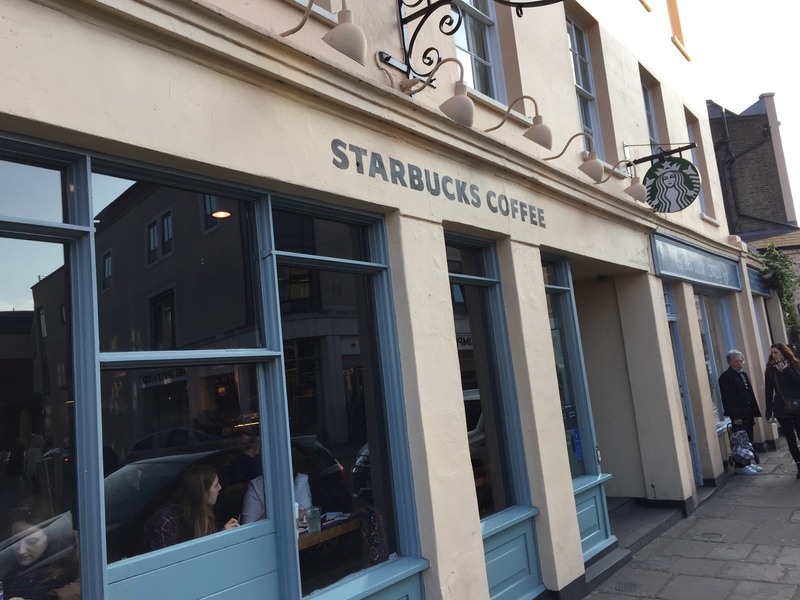 This is the Starbucks in Greenwich, which was the coolest one I have seen the whole trip. 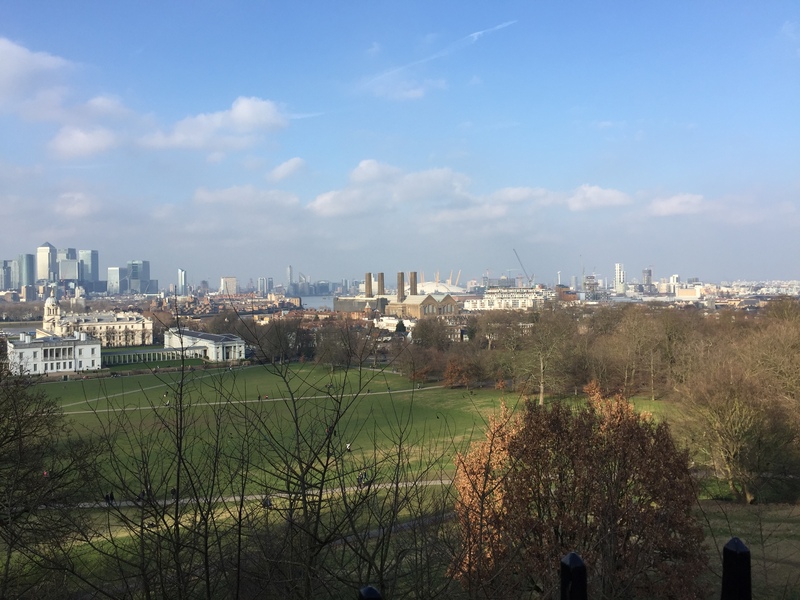 Posted in Life, Travel | Comments Off on London, day six…. We got serious today with our list of places to visit. Depending on how you’d count, we knocked off seven places on our list. I think it had something todo with Rosie’s multiple double-espresso in the morning. Our first stop was the Trafalgar Square and the National Gallery. This was number two on my list of places to visit. The size of Trafalgar Square is hard to understand until you actually see it in person. The fountains out front are huge, we spent 10-15 minutes just crossing it from the tube station. Once we got inside the national gallery, Rosie and Isaac took off at warp speed. I got the map, starting at one in and moving through each hall. I can honestly say that pictures of people are pretty boring to me. My favorites were all of things or places. But what I was surprised about was the size of many of the paintings. Entire rooms were full of portraits, with not a single one smaller than 10 feet tall. I was looking forward to seeing van Gogh’s Sunflowers in person, I would consider it one of his more famous paintings. 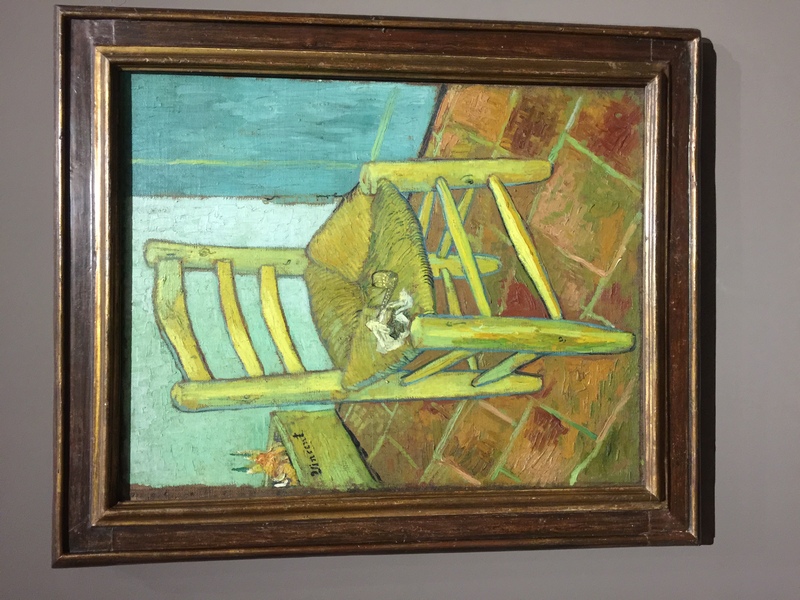 (For the simple fact that it is the only one I could name off the top of my head) But my favorite was van Gogh’s Chair. But of the impressionist, I have always perfered Monet. I just love his water Lily’s and one of the things I am most looking forward to in Paris is seeing the water lily room. 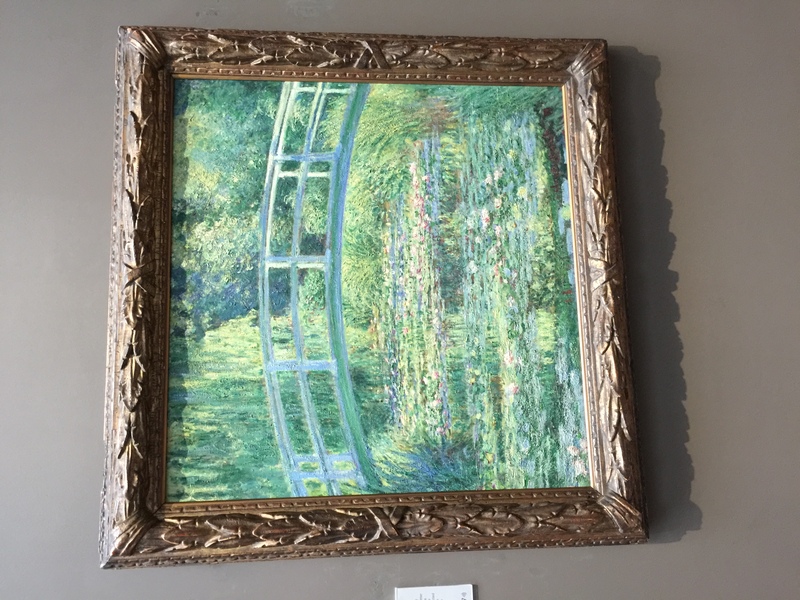 So of course my favorite painting isn’t he national gallery was the The Water Lily Pond. 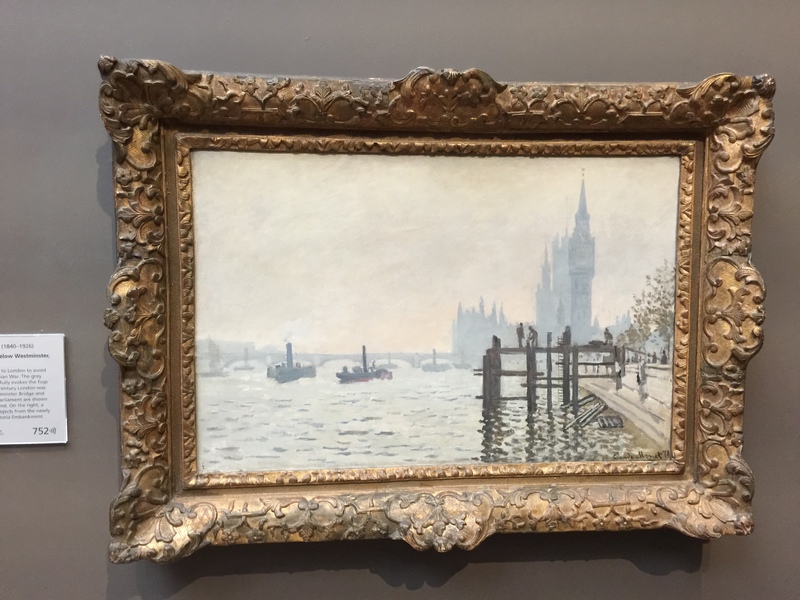 But the National Gallary has may 10 Monet’s and a bunch of them of winter settings. I had never seen a Monet with snow in it, in my limited art history knowledge all of his paintings are of spring and summer settings. 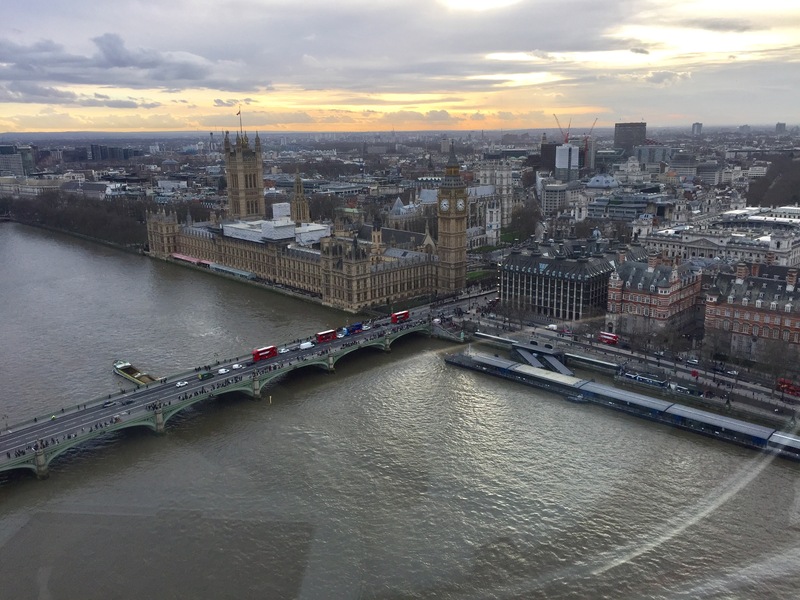 So when I saw The Thames below Westminster, I was blown away. Our next stop was Leicester Square and Piccadilly Circus, since it is maybe five minutes from the National Gallary. It was as crazy with people as you would expect. The line to get into the Lego store was longer any line we have seen for a ‘real’ tourist site. Isaac was good skipping Lego and went straight to the M&M store across the street. I had never seen one of these before, Rosie says there is one in Las Vegas now. It was four different floors (Two above ground and two below) I was so tired of M&M when we finally made it out of there. Since it was now lunch time (at least for us), we went around the corner to what I would call Chinatown, but I am not sure that is what they call it here. We found a dim sum place and had a very taste lunch. 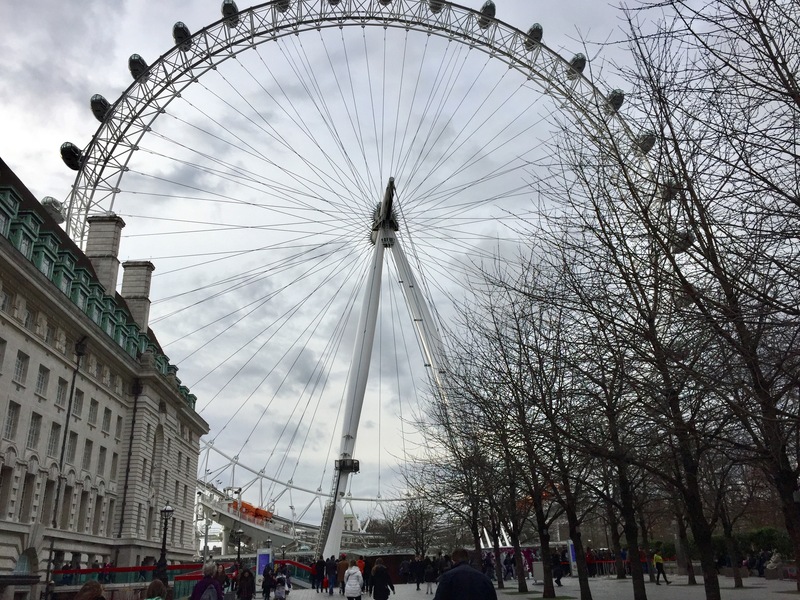 One of the nice things about taking a ride on the London Eye, you get a great view of that part of London. We got to see Big Ben and Parliament pretty well, plus a long distant view of Buckingham Palace. 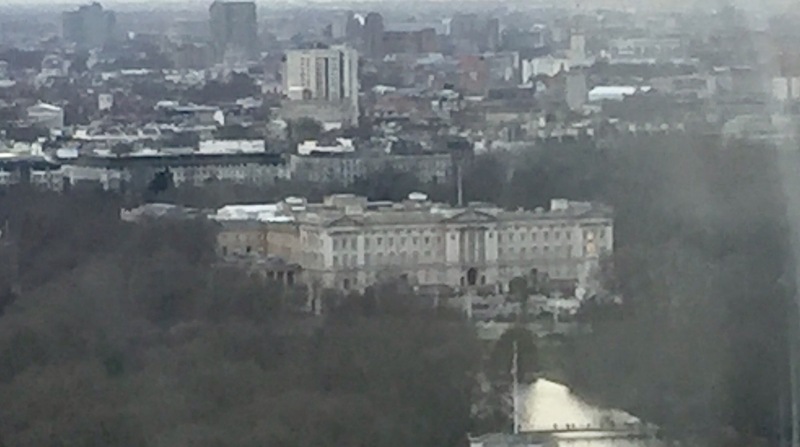 I had to tweak this picture a little (and in my iPhone actually) so you could make out Buckingham Palace. Seeing it up close wasn’t big on my list, but I think Rosie may still try to get over to see it. 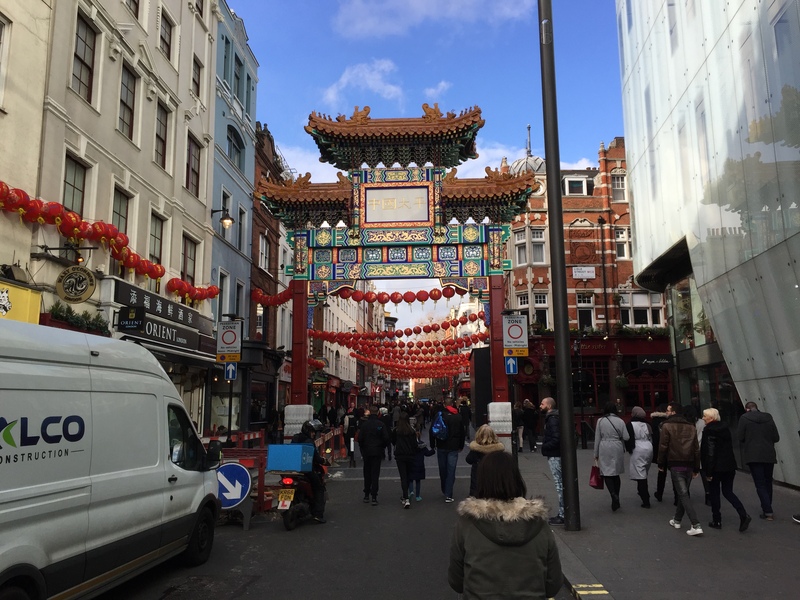 Posted in Life, Travel | Comments Off on London, day four…. Yesterday was another interesting day. The family is still adjusting to the time zone shift, so I was again the first one up and moving. I am spending that quiet time in the morning writing these logs and doing sysadmin things that have been annoying for a while, but never quite had time to fix. Yesterday I finally fixed a problem in PHP/Apache/Wordpress which was preventing me from uploading photo’s when they got more than 2M. 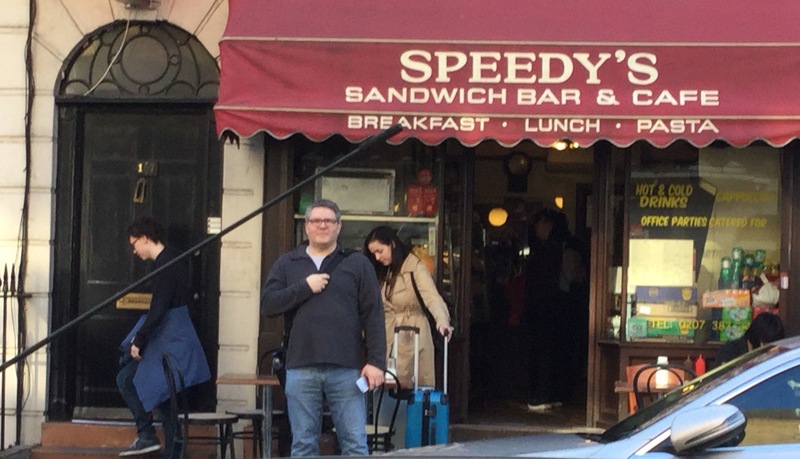 Once we all got moving, we decided to try breakfast at the cafe which is attached to the apartment building we are staying at here in London. Rosie tried a traditional English breakfast, I got a plain omelette and watched. I’ve had them on previous trips, so I knew I didn’t like them. I don’t think she really did either, but my omelette was good. We also did the required amount of Pokémon hunting around the flat, Isaac is enjoying catching all the ‘rare’ Pokémon that appear to be normal here. After that we made our way to the tube station which is close to our flat. I didn’t quite understand how they worked well enough to use it on Tuesday. So we had hiked to the next stop up, which is also on a more common line. Now that we have gotten totally lost and spent a couple hours being lost, we have become experts at navigating them. We were hoping trains like pro’s yesterday and it is really quite convenient. Our first stop was Knightsbridge and wondering around the fancy stores. I had always wanted to visit Harrod’s, which is really quite amazing. We probably spent two hours wondering around and only hit probably three floors. Isaac got another magic trick, which he has been playing with non-stop and I got a pair of workout shorts. It seems one of the ‘stacks’ of stuff that was suppose to get into the suitcase didn’t. The place we are staying has a really complete gym, pool and workout center. I am going to try and take a TKD class today. 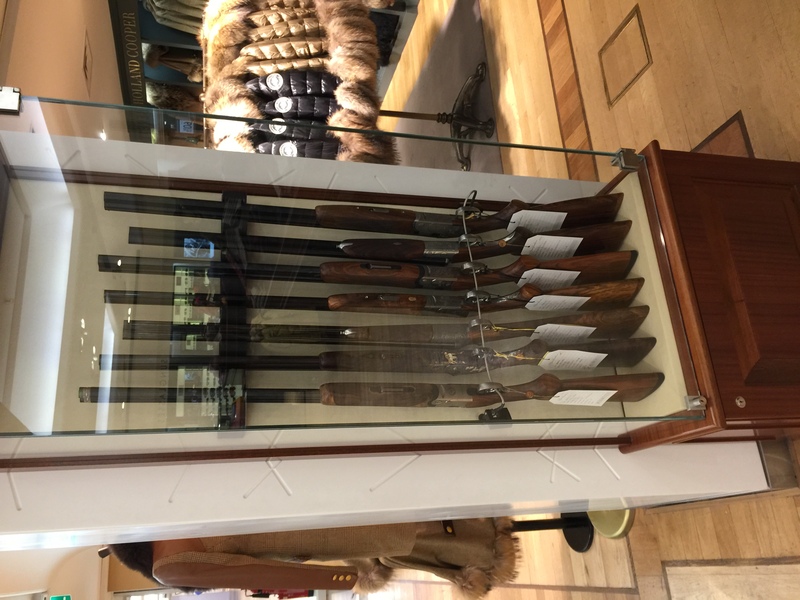 But anyhow, the most amazing thing I saw at harrod’s was the shotguns. I couldn’t believe they sold shotguns. After Harrod’s we got lunch at this little place I saw when we were wondering around. The food was pretty good, but they managed to posison me with dairy. (More on that in a minute) Which is when I realized that none of the wait staff at any of the places we have eaten really speaks English. The lady who waited on us yesterday was clearly not a native speaker, Rosie eventually switched to French, which she seem to understand much better. The Mexican place Isaac and I ate at last night was run by Russians. It is a crazy world! So after lunch we got back not he tube and went a couple stops to where the national science and history museums are located. I don’t think I mentioned this before, but nearly every tube station seems to have a Starbucks in it or at the very least, right outside of it. I really appreciate this, it makes getting my fix very easy. And yes, I have been having London Fog’s in London all week. We decided to go through the science museum first, partly because it had a shorter line to get in. This was another thing that surprised me, there is no charge for these, they are all free. The museum was nice, but still focused for a target audience of about 10. Of course just about the time we got in (because while the line was shorter, there was still a line), my poison lunch required me to visit the little boys room. 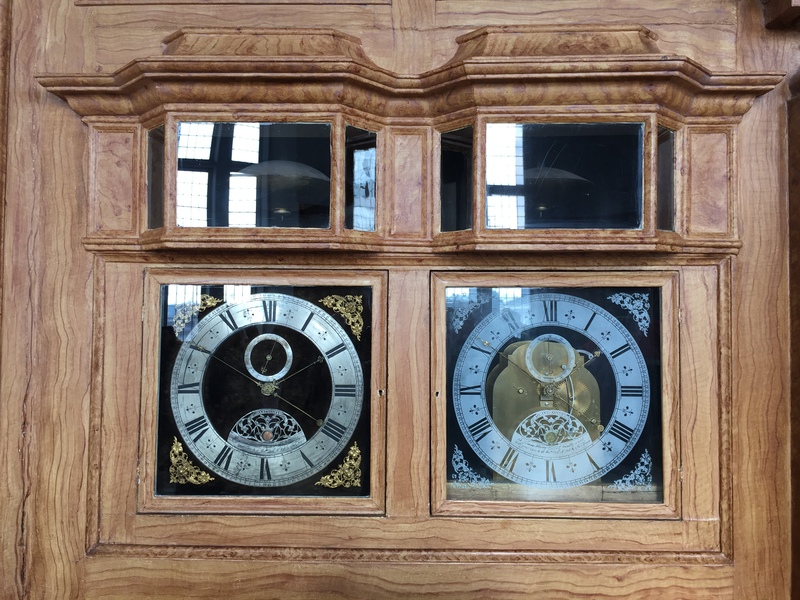 After round one of removing the poison from my system, I walked through the clock exhibit. 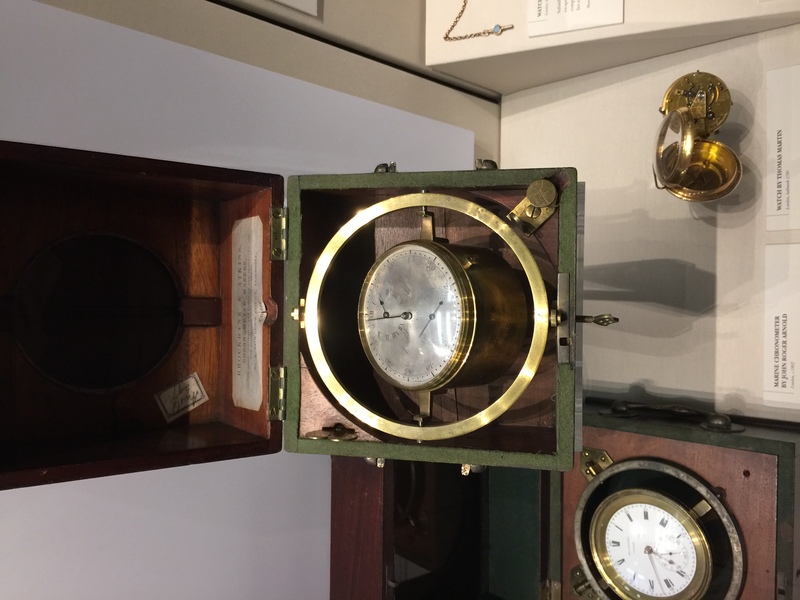 This started with the earliest clocks, but what I really liked was the early sea going clocks that were used to help sailers navigate. The next stop was the ‘high tech’ section, which really meant old computers. 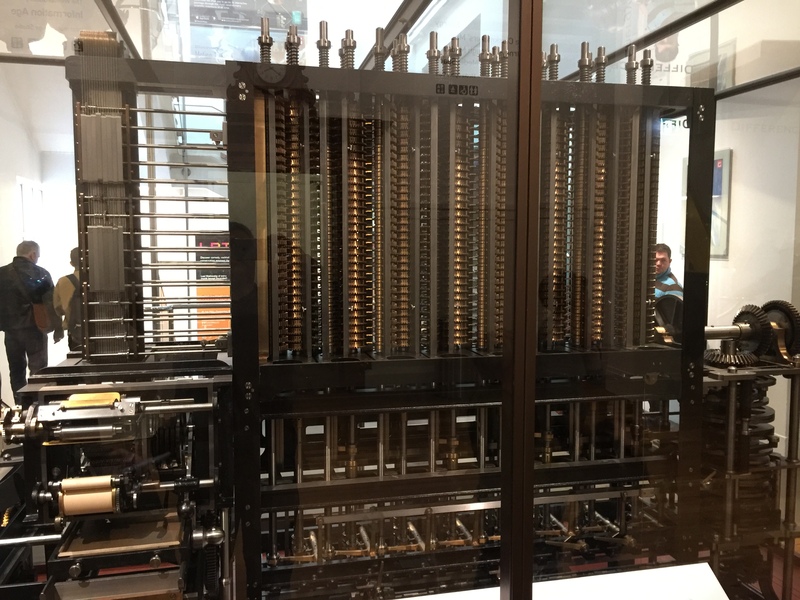 It started with the Babbage Machine II, which was only started by Charles Babbage, but not finished until after his death. 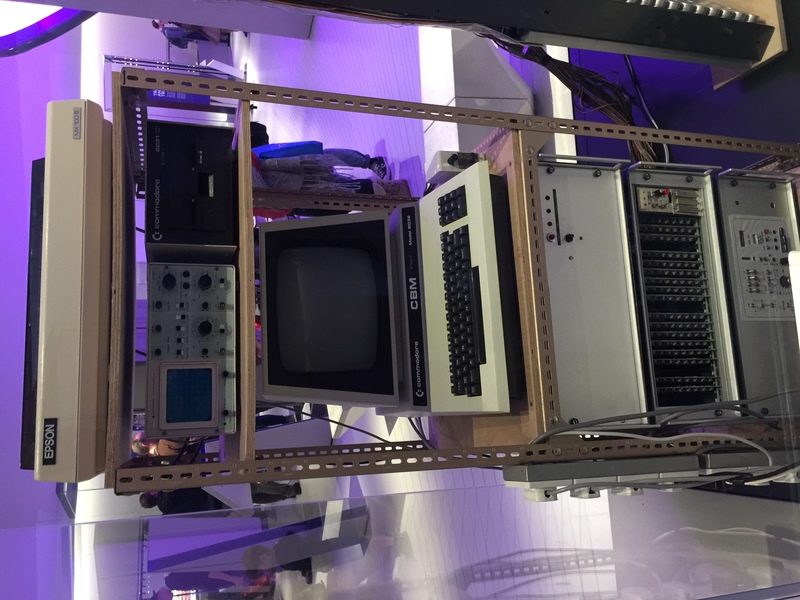 Then it was on to the actual computers run by electricity, like the Mk2 and this really old Commonder PET. This was used for nearly 10 years at some university, before being retired.I don’t remember what this system was actually used for, but it was a general purpose PET wired up todo something specific. I think it calculated weather predictions. About this time I had to make a second trip to the little boys room. I was just finishing up when the fire alarm went off. It took me a minute to even realize what it was, because while it was annoying, it wasn’t as annoying as the fire alarms in the statues. But they evacuated the museum and we got to watch the London fire department fly in in force. Even with he crowds, I manage to find Rosie and Isaac pretty quickly and we decide to call it a day and head home. This time the time the tube station was a ‘crowded’ with everybody trying to leave at the same time. When we got back, Rosie was suppose to go to a Crossfit class, but bailed since she is still not adjusted to the time zone yet and was tired. Isaac and I decided to hike to a Mexican place for dinner while Rosie took a nap. She eventually made it to the gym, while Isaac and I watched two episodes of Arrow on our iPads. Tomorrow it is off to Trafalgar Square and the national gallery. 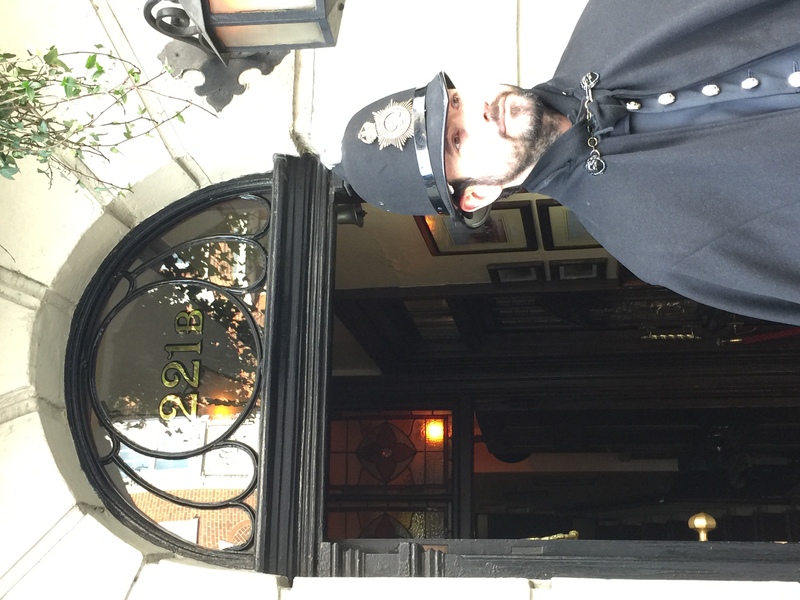 Posted in Life, Travel | Comments Off on London, day three….